A massage gift Voucher is an ideal present for many individuals, especially those who suffers any form of stress or muscle ache, but sometimes even just for someone who wants to relax. A relaxing massage is the perfect gift for any occasions: Birthdays, Christmas time, Mother’s Day, End of study of work periods, and especially Valentine Day. They even work well as a simple ‘Thank You’. Our Gift vouchers can be redeemed at any of our locations during out normal open hours. A gift voucher can only be purchase at least half an hour minimum. Damaged, mutilated or defaced vouchers cannot be exchanged. No liability will be accepted for the replacement or refund of lost stolen or destroyed vouchers. This voucher may be exchanged for a service higher than the face value of the voucher by paying of the difference. Gift Vouchers have an expiry date of 6 months from date of voucher issue. Change is not given on purchases which cost less than the value of the Gift Voucher presented. 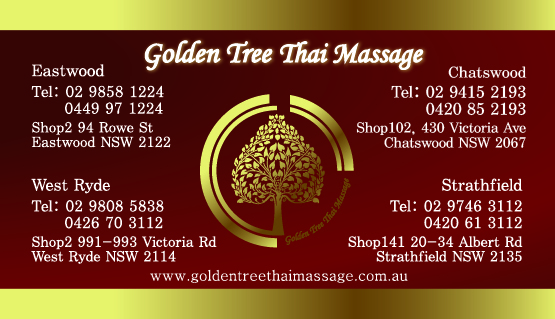 Golden Tree Thai Massage reserves the right to change the Terms and Conditions at any time. For enquiries regarding gift voucher purchases made on this website please click here.